Discussion: A Breakdown of Growing Up - featuring 3 of my #LoveOzYA favourites! Seven years of traversing the erratic, precarious territory of adolescence. 2555 days of wondering how you are ever going to cope with ‘adulting’ in the big bad world out there. A seemingly infinite number of minutes brooding over anything from what your next ingenious caption on Instagram will be, to “what am I going to do with my life?”. These formative teenage years are a melting pot of paradoxes, where the fanaticism associated with the freedom of deserting childhood forever, masks an underlying fear of facing harsh realities which juvenile naivety had previously obscured. 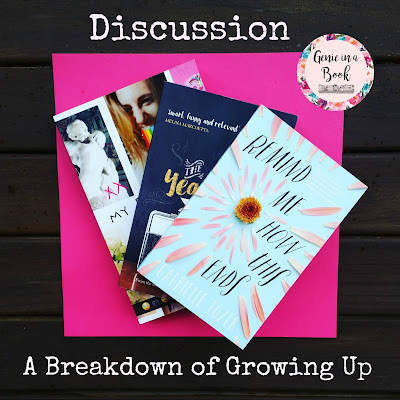 Australian YA novels such as My Best Friend is a Goddess by Tara Eglington, The Yearbook Committee by Sarah Ayoub and Remind Me How This Ends by Gabrielle Tozer provide a relevant snapshot of ordinary teens facing a coming of age. In these examples of a contemporary Bildungsroman, there is more at play than the stereotypical catalysts of angst and raging hormones which create their narrative arcs. These authors have captured not only elements of school life which anyone could relate to, but also the visceral sentiments of self-awareness and grief. Whether it is perceived as an intellectually stimulating atmosphere that allows your mind to flourish, or a detested prison of educational bureaucracy, high school is one of the universal experiences which defines being a young adult. Both Eglington and Ayoub have effectively utilised this dynamic environment in terms of setting, to emphasise the unique social mores that teens contend with and how this affects their self-image. In Goddess, Emily and Adriana have always been the closest of friends, never missing a beat in each other’s lives until Adriana spent eighteen months overseas when her father took up a position in Borneo. When Ade returns, it seems everyone but herself has realised that she’s undergone the ultimate ‘glo up’. Tara Eglington discerningly follows the evolution of their friendship, while reflecting on the impact which the immediacy of social media brings to the ensuing drama. The overall plot has its fair share of adorkable moments, and even a clique of ‘mean girls’, yet never morphs into a cliché. The Yearbook Committee presents a focused cross-section of teens, with five different personalities being thrust together to create their year twelve yearbook. Sarah Ayoub candidly conveys the anxieties, family pressures and vulnerabilities of her characters at this turning point in their lives. From the loner, to the politician’s daughter, the school captain, the popular girl who appears to have it all, and the subversive newcomer who can’t wait to leave that stage of her life behind, these archetypes are all explored, and can be identified with in some way. Gabrielle Tozer’s latest release reaches beyond high school to the murky domain of ‘real life’ which follows. Unsuccessfully striving to maintain a long-term relationship he’s had since sixteen with his girlfriend Sal, Milo’s life in the dead-end town of Durnan seems to be on hold. While his future is vague with no solid plans for TAFE or uni, Tozer writes with clarity on how some people totally transform once they escape the microcosm of high school, leaving those who knew them at that time grappling with the idea of who they have become. What all three of these novels are able to achieve is a genuine insight into how teens relate to each other and induce a collective coming of age. In some instances, blossoming friendships among the most unlikely personalities foster new realisations about the importance of looking beneath the surface of someone’s façade. In others, the most poignant moment is accepting the transience of relationships which were once thought to be forever, and being comfortable with the emotional distance that creates. Interestingly, Eglington, Ayoub and Tozer also explore the enduring implications of grief which inadvertently force their characters to mature. Matty from The Yearbook Committee may not have completely lost his mother, but after her breakdown it is as if she is no longer present. Balancing extra responsibilities at home and the demands of his education has made him shrewder than some of his peers, but Ayoub reminds us that he still may need to turn to other adults for help. In Goddess and Remind Me How This Ends, the death of a mother has an even greater effect. Adriana describes its isolating impact, stating that “grief makes you feel like an alien”. Her new appearance may have caused her peers to forget how they used to taunt her for visiting her mother’s grave, but she is ultimately the same girl who misses the special moments she had with her mum. Tozer has painted her second protagonist Layla as a confident young woman who alternatively attempts to supress the pain of losing someone who had such a profound influence on her life. For these characters, the combination of anger, sadness and reminiscence of their lives before this major event which caused such disruption, is the first of many hurdles which their impending adulthood would bring. These writers depict teens with major tribulations at a time in their lives which is already affected by turbulence; reminding us that adolescence is not merely a facetious rite of passage, but perhaps mandatory call to ‘grow up’ and face life’s tragedies head on. In the real world, teenagers are so often satirized for their histrionics and exaggerated ennui. From reading these novels however, it’s clear that adolescence is one of the steepest learning curves there is. Perhaps we should be looking towards fiction to truly grasp the lives of these individuals teetering on the cusp of adulthood. After all, you were once young too. What do you like most about coming of age novels?